Held in the Sheraton® Atlanta Hotel, the 36th International Congress on Applications of Lasers and Electro-Optics (ICALEO®) once again brought together many of the best and brightest of laser and optics professionals to network. Scientists and scholars reviewed the state-of-the-art in laser materials processing and predicted where the future will lead. 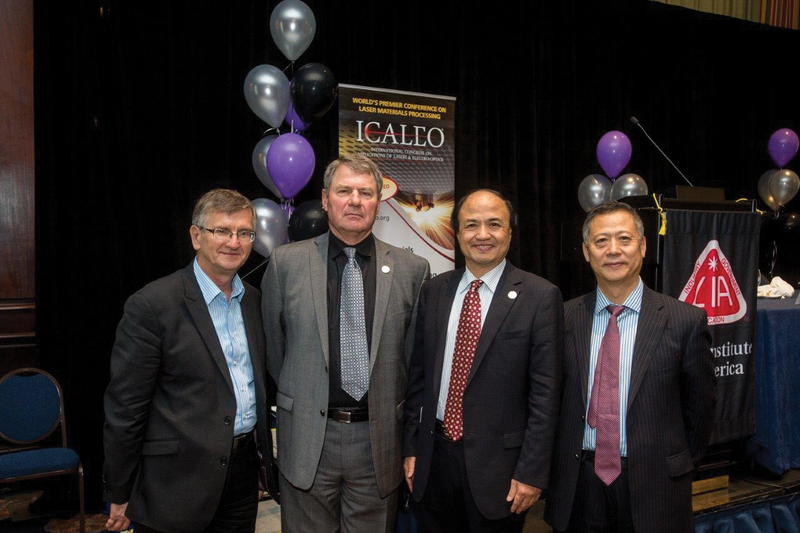 With activities spanning five days, including the pre-conference Welcome Celebration held poolside at the Sheraton Hotel, ICALEO 2017 provided a platform for the current issues at the forefront of laser materials processing. ICALEO 2017 included over 350 participants representing approximately 19 countries. Attendees filled rooms for over 180 presentations including scientific papers, poster presentations and panel discussions. Of course, none of this would have taken place without our 38 sponsors and vendors lending their support. The ICALEO 2017 Plenary Session, “Light at Work: Laser Applications Beyond Imagination,” was presented to a full complement of attendees, many of whom were attending ICALEO for the first time. The plenary session began with a keynote presentation by Dr. Mark Schnitzer, an associate professor at Stanford University, and investigator at the Howard Hughes Medical Institute. He spoke about his work in neural circuit dynamics and optical imaging. Schnitzer described how lasers are pushing the field of brain imaging forward, and his presentation included fascinating videos of his optical trials with mice. The Plenary Session pushed the limits regarding traditional views of laser applications and provided attendees with information on other medical and climate laser advances. Dr. Henry Kapteyn, from the University of Colorado’s Department of Physics, discussed how he builds tabletop x-ray laser light sources, which help develop corresponding applications. Jeff Deems, a researcher at the National Snow and Ice Data Center in Boulder, Colorado, where he also serves as the liaison for the NASA Airborne Snow Observatory, spoke about his work with laser mapping snow packs and developing lidar applications for avalanche forecasting and climate applications. The results indicated that in most cases there was temporal consistency in the spatial distribution of the snowpack, even in different years. The results also highlighted that elevation and the Topographic Position index (TPI) were the main variables explaining the snow distribution, especially during periods dominated by melting. Lastly, the intra- and inter-annual spatial consistency of the snowpack distribution suggests that the geomorphological processes linked to presence/absence of snow cover act in a similar way in the long term, and that these spatial patterns can be easily identified through several years of adequate monitoring. Co-chaired by Klaus Kleine from Coherent Inc and Friedhelm Dorsch from TRUMPF Laser-und Systemtechnik GmbH, the staple conference at this event did not disappoint. There were so many exciting papers presented that it is hard to choose just one example – but Fabian Teichmann’s peer-reviewed presentation, “Investigations of Dual Laser Beam Welding of Aluminum High Pressure Die Casting at Reduced Ambient Pressure,” reemphasized how laser beam welding under vacuum conditions has several distinct advantages, such as the increase of penetration depth, the enhanced degasification, and the overall calming effect on the melt pool when welding ferrous metals. Teichmann pointed out that while using this technique with welding speeds between 2 and 6 m/min, the overall weld bead porosity can be reduced and mechanical strength can be improved when welding under both atmospheric and vacuum conditions using a certain dual beam configuration. Furthermore, it is reported that specific dual-beam configurations can influence the occurrence of porosity when ambient pressure and welding speed are kept constant. Other notable presentations included: “Evaluation of 3D-Printed Parts by Means of High-Performance Computer Tomography” by Elena López and “Experimental Analysis on Melting and Solidification Process of Titanium with Synchrotron X-Ray for Development of Sputter-Less SLM” by Yuji Sato. This year’s conference focused on hot topics in the areas of micro-welding, micromachining and ultrafast processing. However, with the growing market of health-related lasers, we find new and innovative processes to expand the reach of laser microprocessing beyond biomedical applications. Co-chairs Michelle Stock, from mlstock consulting and Cather Simpson, from the University of Auckland, organized a high-level technical track that stimulated the audience and focused on these growing applications. This was emphasized in Jyi Sheuan Ten’s presentation, “Femtosecond Laser-induced Chemical Vapor Deposition of Tungsten Quasi-Periodic Structures on Silicon Substrates”. Sheuan Ten described using a femtosecond laser for a rapid, mask-less deposition technique which can be used for a range of applications, one example being writing conductive tracks for the construction of micro-electronic devices. Sheuan Ten went on to say that this technique can be used for direct deposition of tungsten tracks on silicon substrates from metal organic tungsten hexacarbonyl precursors. Other notable talks included “Combination of Short and Ultrashort Pulse Laser Processing for Productive Large Scale Structuring of 3D Plastic Mould Steel”, by Andreas Brenner and “Femtosecond Laser Structuring of Graphite Anodes for Improved Lithium-ion Batteries” by Jan Habedank. The Nanomanufacturing Conference presented papers relevant to laser technologies highlighting research in emerging technologies in 3-D micro/nanofabrication, as well as laser synthesis and diagnostics of nanomaterial. Koji Sugioka and Daniela Serien’s presentation, “Femtosecond Laser 3D Printing of Proteinaceous Micro and Nanostructures” revealed that focusing the femtosecond laser beam inside transparent materials confines the nonlinear interaction within the focal volume, which enables three-dimensional (3D) micro- and nanofabrication. This allows the construction of 3D micro and nanostructures of proteins by multiphoton cross-linking along the exposure pathway of the focused laser beam. Koji and Daniela went on to say that our ship-in-a-bottle integration technique was applied to integrate 3D proteinaceous micro and nanostructures inside 3D glass microfluidic chips. Other presentations of note were “Laser-Based Synthesis, Processing, and Diagnostics of 2D Materials and Heterostructures,” by Masoud Mahjouri-Samani and “Laser Forward Transfer of Nano-Inks and Nano-Pastes,” by Alberto Pique. Dave Belforte, the editor of Industrial Laser Solutions, anchored an excellent business review session titled “The Global Laser Market and Its Future Development.” Co-chaired by Dr. Bo Gu, BOS Photonics and Klaus Loeffler, TRUMPF GmbH, this exciting half-day event provided valuable insight from a business standpoint regarding the global uses of lasers and where key applications are being developed. Mr. Belforte announced, “Fiber lasers are now 40% of the industrial laser market, a significant percentage that certainly drives laser applications.” Interestingly, laser annealing face plates for the iPhone is the driving application in the laser market which stresses the importance of consumer product applications to the industry. Gu provided the audience with a realistic view of the market, stating that “China installed more than 60,000 laser systems last year.” He then remarked that this could be an opportunity for the non-Chinese laser businesses, but not for long. Other topics discussed were: Business Model of an Applied Not-for-Profit Research Center, Laser Market in Japan, and a round-table discussion that completed the forum. This year’s Arthur L. Schawlow Award, named after 1981 Nobel Prize Laureate Arthur L. Schawlow and founding father of LIA, was bestowed upon Dr. Paul Seiler. At the ceremony, which Seiler was unable to attend, Ruediger Brockmann from TRUMPF GmbH in Germany stepped in to present his work recognizing Seiler as the father of industrial solid state lasers in Germany and accrediting him with having a significant impact on the growth of users including Philips, Osram. “Paul combined his mechanics and engineering expertise with his passion for lasers to pioneer laser systems for diamond die drilling, fine welding of watch flat spiral springs, welding cathode components for television and invention of the laser light cable,” Brockmann said. Now called fiber optics, Seiler initiated and drove rapid expansion of solid state lasers into high volume manufacturing applications. Dr. Seiler joins the world-renowned list of recipients including Arthur Schawlow, Arthur Guenther and Theodor Hänsch. Dr. Paul Seiler is a recognized pioneer in laser technology for industrial use. He studied precision mechanics at the University of Applied Sciences in Karlsruhe, Germany. From 1992 until 2003, Dr. Seiler was the managing director of TRUMPF Laser GmbH & Co. KG in Schramberg. In 2008, he received an honorary doctorate from the University of Stuttgart. New to the awards program was the Peter M. Baker Leadership Award which was established last year. The award is given annually to an individual who has demonstrated outstanding leadership in an organization or a company that has significantly benefited the world laser community or has led to major global impacts in the advancement of laser science, technology, engineering or applications. This year’s recipient Prof. Dr. Reinhart Poprawe, Director of the Fraunhofer Institute in Aachen, Germany was recognized for his outstanding leadership in the international laser community. Clearly, Prof. Dr. Reinhart Poprawe was surprised with being chosen to receive this prestigious award. In his remarks at the ceremony, he described the opportunities and challenges of leadership in the 21st century for all organizations. This year’s Vendor Reception showcased many products and services offered by the many sponsors and vendors. Dozens of tables were covered with everything from lasers and various facilitating tools to information about services, societies and research facilities. Filling the entire ballroom, the reception put vendors and end users together to share product ideas and uses for some of the new cutting-edge laser tools and services available. The relaxed yet inviting setting created an atmosphere in which attendees and vendors alike could network and form relationships for future projects and alliances. ICALEO would not be possible without the vendors who participate and our generous Sponsors. This year’s Sponsors included IPG Photonics, TRUMPF Inc. Edgewave GmbH Innovative, Laserline, Inc., Light Conversion, Lumentum, Spectra-Physics, an MKS Brand, and SPI Lasers. The 2017 Closing Plenary Session was a joint session which focused on how lasers drive innovations from nano- to macro applications, and covered a broad span of laser applications and techniques. The first presentation, an invited paper by Wayne King of Lawrence Livermore National Laboratory, “Achieving ‘Just Press Print’ for Metal Additive Manufacturing”, kicked off this closing session. Wayne presented the challenge of replacing the experience-based approach presently used to produce parts with a science-based, automated approach that can be implemented on the factory floor. The intelligent feed-forward approach, when successfully implemented, will ensure right every time production or early automated rejection, thus buying down risk. The approach is meant to be agnostic to feedstock, machine, and geometry. Prof. Minlin Zhong from Tsinghua University in Beijing presented the second presentation, “Diverse Nanostructures and Magic Nano-Functions Induced by Ultrafast Laser.” Zhong spoke about the importance of graphene for electronic applications and how the laser must be used for patterning in this industry. He also noted that China provided funding for a five-year national project to develop ultrafast laser-based 2D manipulation technology for thinning the graphene with precise layer control for arbitrary patterning. This technique provides strong fabrication capability for graphene devices. He went on to discuss new types of graphene sensing that require high sensitivity which includes gas, liquid acoustic, touch, skin, strain and electromechanical sensors. According to Zhong, this can only be done with lasers. The session closed with the presentation, “Accelerating the Additive Manufacturing Revolution” by Florian Bechmann of Concept Laser GmbH. LIA would like to extend congratulations to the ICALEO Student Paper Award Winners who receive a cash award, a certificate of achievement, and whose manuscripts will enter the Peer Review Process for publication in the LIA’s Journal of Laser Applications®. The Poster Presentation Gallery was another example of the variety of laser research prevalent today. The ICALEO 2017 Poster Presentation Contest winners are listed below. ICALEO was the pinnacle laser conference for 2017; it was also a looking glass to the future of laser manufacturing and processing. The attendees were treated to some of the best Atlanta has to offer while pursuing their passion for lasers and optics. The papers presented and the insights, innovations and breakthroughs explored during the event show how the efficient and eco-friendly use of lasers is at the forefront of global technology. By staying at the forefront of the laser and electro-optics research and business activities worldwide, the Laser Institute of America and ICALEO are yet again leading the way by example. Join us next year as we celebrate 50 years of advancing laser technology! Happy birthday, LIA! Jim Naugle is the Marketing Director at the Laser Institute of America.